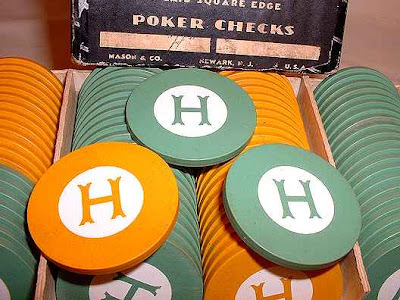 I went on about my lifelong hatred of games on Hovey Vintage a while back. Wow. It's so true. Gambling is worse. I do buy mega millions tickets, but get me in any Vegas-style situation and my stomach turns. It combines said hatred of gaming with my other great dread, trading money for things that don't either feed me or decorate my home. But if I were a different person completely, I'd have to buy these. So, if any of you Hoffmans, Howards, Huffingtons or Howells out there like to gamble, then these are going for $24.99 with 4 days left in the auction. I feel the same way! Every year I go home for Christmas, I have to play a game,when I'd rather be staring at the fire, or relaxing. I have really tried to get in on the 'family time' routine, but I do so begrudgingly. Have a great party, by the way!